The United States Federal Aviation Administration’s (FAA) Wide-Area Augmentation System (WAAS) for civil aircraft navigation is focused primarily on the Conterminous United States (CONUS). Other Satellite-Based Augmentation Systems (SBAS) include the European Geostationary Navigation Overlay Service (EGNOS) and the Japanese Multi-transport Satellite-based Augmentation System (MSAS). Navigation using WAAS requires accurate calibration of ionospheric delays. To provide delay corrections for single frequency global positioning system (GPS) users, the wide-area differential GPS systems depend upon accurate determination of ionospheric total electron content (TEC) along radio links. 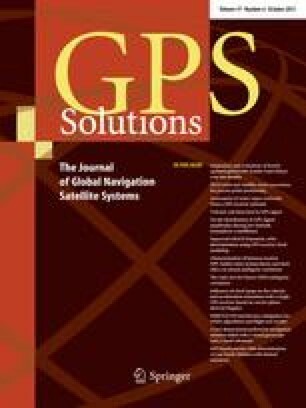 Dual-frequency transmissions from GPS satellites have been used for many years to measure and map ionospheric TEC on regional and global scales. The October 2003 solar-terrestrial events are significant not only for their dramatic scale, but also for their unique phasing of solar irradiance and geomagnetic events. During 28 October, the solar X-ray and EUV irradiances were exceptionally high while the geomagnetic activity was relatively normal. Conversely, 29–31 October was geomagnetically active while solar irradiances were relatively low. These events had the most severe impact in recent history on the CONUS region and therefore had a significant effect on the WAAS performance. To help better understand the event and its impact on WAAS, we examine in detail the WAAS reference site (WRS) data consisting of triple redundant dual-frequency GPS receivers at 25 different locations within the US. To provide ground-truth, we take advantage of the three co-located GPS receivers at each WAAS reference site. To generate ground-truth and calibrate GPS receiver and transmitter inter-frequency biases, we process the GPS data using the Global Ionospheric Mapping (GIM) software developed at the Jet Propulsion Laboratory. This software allows us to compute calibrated high resolution observations of TEC. We found ionospheric range delays up to 35 m for the day-time CONUS during quiet conditions and up to 100 m during storm time conditions. For a quiet day, we obtained WAAS planar fit slant residuals less than 2 m (0.4 m root mean square (RMS)) and less than 25 m (3.4 m RMS) for the storm day. We also investigated ionospheric gradients, averaged over distances of a few hundred kilometers. The gradients were no larger than 0.5 m over 100 km for a quiet day. For the storm day, we found gradients at the 4 m level over 100 km. Similar level gradients are typically observed in the low-latitude region for quiet or storm conditions. This research was performed at the Jet Propulsion Laboratory/California Institute of Technology under contract to the National Aeronautics and Space Administration and the Federal Aviation Administration.